Posted on 20, November 2018 by EuropaWire PR Editors | This entry was posted in Automotive, Education, Sweden, Transportation & Logistics and tagged GHANA, heavy vehicle, heavy_vehicle, Robert Bosch, Scania, service technicians, technicians, training, TRANSPORT, Trucks, WATA, West African Transport Academy. Bookmark the permalink. 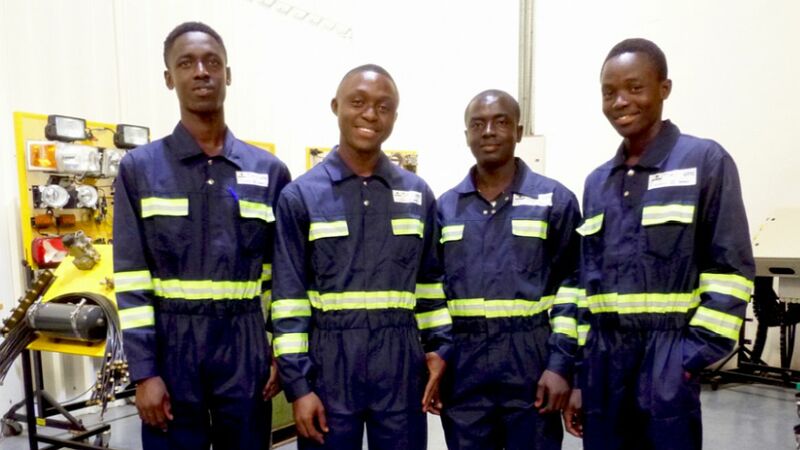 First heavy vehicle service technicians graduate in Ghana. Södertälje, Sweden, 20-Nov-2018 — /EuropaWire/ — The training for service technicians at the West African Transport Academy (WATA) in Ghana’s capital city Accra is the first of its kind. It enables students to specialise in heavy truck and bus technology, combining apprenticeships at a company and education at a vocational school in a single course. The aim is to supply the Ghanaian transport and logistics sector with skilled and qualified technicians and bus drivers, thereby increasing road safety. Starting in September 2017, 18 students from the Government Technical Training Centre (GTTC) attended the course at WATA. Over the past year, they have done various theoretical training modules and received practical skills in various technologies and subjects such as maintenance, electrics and fuel systems. Some of the time was spent at the different project partners and other companies in the transport sector: Scania West Africa, MAC Ghana, Metro Mass Transit and Intercity STC. By the sound of it, the students are very pleased with what they have learned. Kelvin Hammond, who attended the course, says: “The WATA training programme is very hands-on, and as a trained auto-electrician, I can now confidently service heavy vehicles and diagnose problems with them.” The skills he has acquired have made him more versatile and this, he believes, will enhance his employability. David Quarshie, another student, says: “In the ever-evolving field of auto-mechanics, the course at WATA has enabled me to upgrade and learn new skills that will make me stand out among my colleagues in the field. West African Transport Academy (WATA) is a joint project by Scania, Deutsche Gesellschaft für Internationale Zusammenarbeit (GIZ), Robert Bosch, ZF , Westinghouse Air Brake Company (WABCO) and the Government Technical Training Centre (GTTC). This is a vocational school belonging to the Ministry of Transport (MoT) in Ghana.